Background Increasing evidence suggests that preterm birth affects later lung function. We systematically reviewed the literature to determine whether percentage predicted forced expiratory volume in 1 s (%FEV1) is lower in later life in preterm-born subjects, with or without bronchopulmonary dysplasia (BPD), compared with term-born controls. Methods Studies reporting %FEV1, with or without a term-born control group, in later life for preterm-born subjects (<37 weeks gestation) were extracted from eight databases. Data were analysed using Review Manager and STATA. The quality of the studies was assessed. Results From 8839 titles, 1124 full articles were screened and 59 were included: 28 studied preterm-born children without BPD, 24 with BPD28 (supplemental oxygen dependency at 28 days), 15 with BPD36 (supplemental oxygen dependency 36 weeks postmenstrual age) and 34 born preterm. For the preterm-born group without BPD and for the BPD28 and BPD36 groups the mean differences (and 95% CIs) for %FEV1 compared with term-born controls were −7.2% (−8.7% to −5.6%), −16.2% (−19.9% to −12.4%) and −18.9% (−21.1% to −16.7%), respectively. Pooling all data on preterm-born subjects whether or not there was a control group gave a pooled %FEV1 estimate of 91.0% (88.8% to 93.1%) for the preterm-born cohort without BPD, 83.7% (80.2% to 87.2%) for BPD28 and 79.1% (76.9% to 81.3%) for BPD36. Interestingly, %FEV1 for BPD28 has improved over the years. Conclusions %FEV1 is decreased in preterm-born survivors, even those who do not develop BPD. %FEV1 of survivors of BPD28 has improved over recent years. Long-term respiratory follow-up of preterm-born survivors is required as they may be at risk of developing chronic obstructive pulmonary disease. Is percentage forced expiratory volume in 1 s (%FEV1) lower in later childhood and adulthood in preterm-born subjects (<37 weeks gestation), with or without bronchopulmonary dysplasia (BPD), compared with term-born subjects (≥37 weeks)? Preterm-born subjects of <37 weeks who do not develop BPD in infancy have moderate deficits of %FEV1 of approximately −7.2% compared with term-born controls; infants who develop BPD, defined as supplemental oxygen dependency at 28 days of age or until at least 36 weeks postmenstrual age, have greater deficits in %FEV1 of −16.2%, and −18.9%, respectively, compared with term-born controls. Our findings suggest that all preterm-born survivors are at risk of long-term deficits in %FEV1; however; there has been an improvement in %FEV1 over the last three decades for the group with supplemental oxygen dependency at 28 days. Evidence suggests that being born preterm has adverse effects on later lung function, especially if associated with the development of bronchopulmonary dysplasia (BPD) in infancy.1 ,2 BPD, often also called chronic lung disease of prematurity, is a common disease of extremely preterm-born infants characterised by prolonged supplemental oxygen dependency and dysregulated lung growth. While there have been several studies of lung function outcomes in preterm-born subjects, most have focused on those who developed BPD. Some studies have investigated later lung function outcomes of low birth weight infants (<2.5 kg) but do not distinguish between preterm-born and term-born infants with evidence of intrauterine growth restriction.3 It is clearly important to distinguish between the two as different mechanisms lead to lung function deficits. Studies reporting respiratory outcomes of preterm birth have produced inconsistent results, which may be explained partly by poorly defined populations, including comparison groups, differences in the gestational ages of the preterm-born subjects and methodological differences. Furthermore, there have been temporal changes in the medical management of preterm-born infants, especially the routine use of antenatal corticosteroids, introduction of surfactant therapy and gentler modes of mechanical ventilation that may have altered the relationship between prematurity, BPD and lung function over time. Although a systematic review of outcomes in young adults (≥18 years) who had BPD in infancy has recently been published, a formal meta-analysis was not possible due to the heterogeneous nature of the studies.4 To our knowledge, there has not been a systematic review with meta-analyses of all studies reporting later percentage predicted forced expiratory volume in 1 s (%FEV1) for children or adults born preterm with or without BPD. We therefore conducted a systematic review to determine whether %FEV1 in later childhood and adulthood is lower in preterm-born subjects (<37 weeks gestation) with or without BPD compared with term-born subjects (≥37 weeks gestation). We developed a search strategy using the keywords and medical subject headings (MeSH) terms given in online supplementary appendix 1 for eight databases: CINAHL, Embase, HMIC Health Management Consortium, Medline, Scopus, OpenSIGLE, Web of Knowledge (Science Citation Index Expanded, Social Science Citation Index, ISI proceedings). The databases were searched in May 2010 and October 2011. Websites of Action Medical Research, SPARKS and the Wellcome Trust were also searched and references in the included studies were also screened for inclusion. Published studies were eligible for inclusion if they reported %FEV1 in later life for preterm-born infants, defined as a gestation of <37 weeks, with and without BPD. The comparison with infants born at term, defined as a gestation of ≥37 weeks, was made by comparing with a contemporaneous term-born control group; comparison was also made using historical controls by using the percentage predicted values with the notional 100% representing an average in the population. We included only papers which had already calculated the percentage predicted FEV1 and did not discriminate on the basis of which reference values were used, assuming the authors would have used the most appropriate reference values for their populations. We included studies that recruited based on the subjects’ birth weight, but only included studies which reported the %FEV1 of preterm-born infants (whether recruited on gestational age or birth weight). BPD was defined as dependence on supplementary oxygen either at 28 days of life or at 36 weeks postmenstrual age (PMA). Childhood was defined as <18 years and adulthood ≥18 years of age. The lung function measure primarily studied was %FEV1 obtained by spirometry, hence mainly used for children ≥5 years. Studies that reported other measures of lung function were eligible but were not included in the meta-analyses. Studies in all languages and from all countries were included. Two reviewers (SJK and MOE) independently screened each reference title and abstract (if available) using the inclusion criteria. Complete papers were obtained for those that met the inclusion criteria. Abstracts that did not meet the inclusion criteria were excluded. Both reviewers then screened the full paper against the inclusion criteria. For any disagreement, a third reviewer (SK) made a final decision. A data extraction form (see online supplementary appendices 2 and 3) was initially piloted independently on 10 papers by SJK, WJW, SP, FD, SK and MOE. SJK and MOE extracted data from the remaining articles. The authors of articles were contacted if possible for further details if the information was presented only graphically or if the data were not extractable (eg, if data for term-born and preterm-born children were combined). Multiple articles from the same cohort were reviewed by SK and SJK and the article reporting the most complete data from the highest number of subjects was included in the analysis. Data from included papers were extracted and entered into Review Manager V.5.1 and STATA V.10 (Stata Corporation, Texas, USA) for analysis. A proforma shown in online supplementary appendix 3 was used to assess study quality based on relevant criteria from the Newcastle Ottawa criteria and the Cochrane risk of bias tool, focusing on the risks of selection, measurement and attrition bias. This was piloted and data extracted as detailed above. Each study was assessed and scored for representativeness of the cohort, appropriate selection of the non-exposed group, exposure ascertainment and demonstration that the outcome of interest was not present at the start of the study, outcome assessment and adequacy of follow-up. The minimum possible score was 6 and the maximum possible score was 20. Mean %FEV1 was the principal outcome. Statistical analyses were performed using Review Manager for studies including a term-born control group and STATA for pooling all the data on preterm-born subjects, with or without a control group. The method of Hozo et al was used to convert the medians to means where possible for included articles reporting median values.5 For graphically presented data, the graphs were read as accurately as possible. BPD28 (defined as supplemental oxygen dependency at 28 days of life in preterm-born infants). BPD36 (defined as supplemental oxygen dependency at 36 weeks PMA in preterm-born infants). Preterm-born subjects (general populations which may include BPD cases). Separate analyses were performed for those studies that included term-born controls and those not including term-born controls but reporting %FEV1 based on historical control (reference value) data. For the latter, separate meta-analyses provided pooled estimates of the mean %FEV1 for preterm-born subjects; this could be compared with 100% as a notional control mean. Studies which presented FEV1 results not expressed as percentage predicted were excluded as insufficient information was available to calculate predicted values. We performed a sensitivity analysis to assess the effect of study quality by including only studies which scored ≥12 in each grouping. A funnel plot was used to assess if there was a risk of publication bias. We also explored if there was an association between year of birth, surfactant use or age at time of FEV1 testing and later %FEV1 using linear weighted regression in the BPD groups only. The studies were weighted inversely by the variance of the estimate of the mean. Linearity was checked by examining residuals. In studies which recruited subjects over a number of years, we used the midpoint between the first and last year of birth in the analysis. The search strategy identified 8839 titles and abstracts; 1124 full articles were screened and 206 met the inclusion criteria (figure 1). Of these papers, 59 studies reporting on %FEV1 for the preterm-born groups were included in the meta-analysis (E1–29, E51–E60, E71, E73–92; online supplementary data). Some were included in more than one analysis. Twenty-eight studies compared a term-born group with a preterm-born group without BPD (E1–E29; online supplementary data); 24 with a BPD28 group (E3, E4, E10, E14, E16, E18, E19, E21, E23–E26, E28, E29, E51–E60; online supplementary data); 15 with a BPD36 group (E1, E5, E6, E8–E13, E15, E16, E20, E22, E27, E29, E71; online supplementary data); and 34 with a general preterm-born group (including some subjects with BPD) (E1–E4, E6, E7, E9, E14, E15, E17, E20, E22, E24, E26, E73–E92; online supplementary data). Five of the 1124 full articles were excluded as the FEV1 was not reported as percentage predicted values. Five of 10 articles reporting median %FEV1 were included as means could be calculated and are included in the 59 included studies. The characteristics of the included articles are given in online supplementary tables E1–E4. Studies included subjects born between 1964 and 2000; their ages ranged from 5 to 23 years and the preterm-born subjects were born between 24 and 36 weeks gestation. Term-born control groups in general were of a similar age to the preterm-born children. For the preterm-born subjects, rates of ventilation and surfactant administration varied widely. Overall, the studies were of moderate quality with scores ranging from 6 to 19 (median 12). Across the studies there was a moderate risk of selection bias. In 33 studies no information was given about how gestation at birth was measured, so possibly there was a high risk of bias in the domain of exposure ascertainment. In 16 studies data were collected retrospectively so exposure ascertainment would not have been independent of outcome status. In the majority of studies no description was provided about how outcomes were ascertained, so it was not possible to reliably judge the potential for risk of bias in this domain. The primary comparison was between preterm-born and control groups as some of the sources of heterogeneity are removed by this within-study comparison. In the preterm-born group without BPD, the mean difference for %FEV1 was −7.2% (95% CI −8.7% to −5.6%) compared with term-born controls. The comparisons between the BPD and term-born groups showed larger differences (mean difference for BPD28 and BPD36 groups −16.2% (95% CI −19.9% to −12.4%) and −18.9% (95% CI −21.1% to −16.7%), respectively). The mean difference for %FEV1 was −8.7% (95% CI −11.0% to −6.4%) for the preterm-born subjects (including BPD cases) compared with term-born controls (figures 2⇓⇓–5). Percentage predicted forced expiratory volume in 1 s (%FEV1) of the premature group (no bronchopulmonary dysplasia, BPD) compared with term control group. Percentage predicted forced expiratory volume in 1 s (%FEV1) of the bronchopulmonary dysplasia (BPD) group (supplemental oxygen-dependency at 28 days of life) compared with term control group. Percentage predicted forced expiratory volume in 1 s (%FEV1) of the bronchopulmonary dysplasia (BPD) group (supplemental oxygen dependency 36 weeks postmenstrual age) compared with term control group. 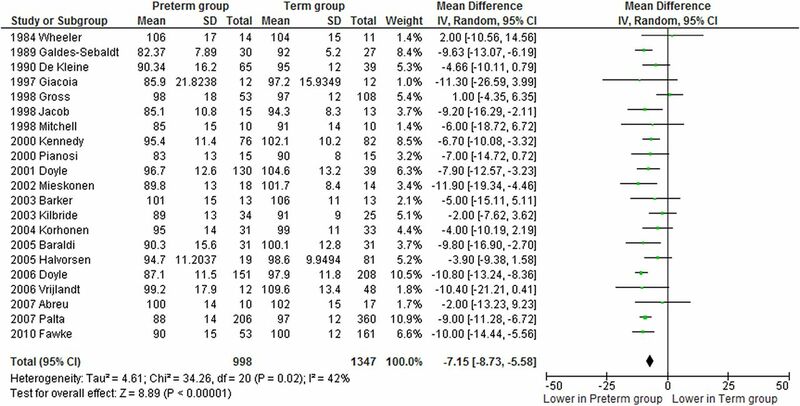 Percentage predicted forced expiratory volume in 1 s (%FEV1) of the preterm group (including groups with bronchopulmonary dysplasia, BPD) compared with term control group. Pooling all the data on preterm-born subjects whether or not there was a control group gave a pooled estimate of the mean %FEV1 of 91.0% (95% CI 88.8% to 93.1%) for the preterm-born cohort without BPD, 83.7% (95% CI 80.2% to 87.2%) for the BPD28 group, 79.1% (95% CI 76.9% to 81.3%) for the BPD36 group and 89.4% (95% CI 87.0% to 91.7%) for the preterm-born subjects (including BPD cases) (see online supplementary figures E1–E4). These differences using 100% as a notional comparator were slightly larger than when comparing with a control group. Including studies which estimated means from the medians had little impact on the results. Funnel plots showed a low risk of publication bias. Including only the higher quality articles made very little difference to the results (see online supplementary data). We examined the effect of year of birth, surfactant use and age at lung spirometry on later %FEV1 in the BPD groups only. Age at time of FEV1 testing appeared to have little effect on later %FEV1 (data not shown). Additional information would be obtained from longitudinal studies, but there were insufficient numbers of these studies to reach a reliable conclusion. There was inadequate data to examine the effect of surfactant. %FEV1 for the BPD28 group may have improved over the years (figure 6). The estimated change per year of %FEV1 for the BPD28 group was 0.57% and 0.01% for the term-born controls. No such improvement was apparent in the BPD36 group, although there were fewer studies reporting this outcome (data not shown). Effect of year of birth on percentage predicted forced expiratory volume in 1 s (%FEV1) for the bronchopulmonary dysplasia (BPD) group supplemental oxygen dependency at 28 days (closed circles) and the term control group (open circles). Weighting was based on two separate models, one for the BPD28 group and one for the term control group. Weighting was defined by variance which differs for the term control and BPD28 group. Bubble sizes show relative contributions based on individual weighting of term control and BPD28 group. The E-numbers refer to references which are given in the online data supplement. To our knowledge, this is the first systematic review and meta-analysis that included all available evidence on later %FEV1 of preterm-born infants with and without BPD, although a previous descriptive systematic review reported lung function in adult survivors of BPD.4 With increasing rates of preterm births6 and improved survival, it is important to investigate the long-term consequences associated with being born during a critical stage of lung development.7 Our analyses show that preterm-born subjects without BPD had moderate deficits in their %FEV1 of approximately −7.2%, while the BPD28 and the BPD36 groups had greater deficits in %FEV1 of −16.2% and −18.9%, respectively. It is of great interest to note that there was an improvement in %FEV1 over the three decades in the BPD28 group. Prematurity is associated with delivery at an immature stage of lung development, especially for the very preterm-born infants born at <32 weeks gestation,7 but even those born at <37 weeks are vulnerable to increased rates of respiratory illness in infancy.8 The modern management of preterm-born infants, including the routine use of antenatal corticosteroids, surfactant treatment and gentle mechanical ventilation, has undoubtedly improved survival, especially of more immature infants, and has possibly led to improved later %FEV1. Perhaps not surprisingly, preterm-born infants who develop BPD in infancy continue to have respiratory function deficits as has been consistently reported in many studies. However, of particular note is the improvement in %FEV1 for the BPD28 group over the decades despite survival of increasingly preterm-born infants. While our data suggest that %FEV1 may have improved in the BPD28 group over the last few decades, the data need to be interpreted with caution as other factors such as selection bias of the worst survivors of prematurity and small numbers, especially for the early studies, may explain the reported lower %FEV1 values. Due to a smaller number of studies, confirmation was not possible for the BPD36 group. One possible factor for this potential improvement is the introduction of surfactant which improves lung compliance markedly in the neonatal period, but insufficient data were available to perform a meta-regression to assess its role in future lung function. Preterm-born children (with and without BPD) may experience increased respiratory symptoms often reported as asthma and have increased reported bronchodilator use and increased health utilisation including hospitalisation, especially in early childhood.13 Children who had BPD in infancy may also have increased exercise-induced bronchoconstriction and, importantly, may have reversible bronchoconstriction at rest, as recently reported.7 ,14 It is not currently known whether the deficit in %FEV1 shown for preterm-born subjects without BPD is reversible. We would also have liked to investigate further the influence of gestational age on later %FEV1, but we were unable to classify the group of preterm-born infants without lung disease into different gestational groups as data were not available. It is likely, as we recently reported, that different gestational groups including the very preterm-born and moderately preterm-born groups (33–34 weeks gestation) have greater deficits of lung function in later life than those born at 35–36 weeks gestation.15 ,16 In addition, even infants identified as having BPD will have been exposed to ever-changing interventions and also changing pathology of ‘old’ versus ‘new’ BPD. Our data on changes in %FEV1 over the last 2–3 decades shows an improvement, which may reflect improvements in the management of these infants but may also reflect the changing pathology of the underlying multifactorial disease we recognise as BPD. Identifying the deficits in lung function is important as children born preterm may have life-long consequences including being potential candidates for the development of COPD, especially if they are exposed to noxious substances such as tobacco smoke or increased environmental pollution. Furthermore, it is unclear if the deficits in %FEV1 that we have reported are translated into increased respiratory symptoms or, indeed, are reversible with bronchodilators. However, it is clear that further studies are required to determine whether these children and young adults would benefit from closer follow-up and treatment in childhood and beyond. Since some studies did not include a control group but reported %FEV1 against prevalent reference values at the time of publication, we performed two separate analyses to compare the results obtained when comparisons with a term-born control group or with historical reference values were reported. The pooled effects for the latter were slightly greater and, as expected, there was greater heterogeneity between the studies as systematic differences between populations and methods of calculating predicted values affect this synthesis. In addition, the reference values used may not be contemporaneous, changing only every few decades; and we accepted the reference values used and have not attempted to standardise them which could be another source of heterogeneity. As with all systematic reviews, we were limited by the quality and quantity of information presented in the included articles. This led us to exclude five papers where the results were presented as medians. Further studies which did not report results as percentages of predicted values were also excluded. In a small number of articles we estimated %FEV1 results from graphically presented data which may have led to small errors, but these are unlikely to have a major effect on the findings. We were only able to contact the authors of the recently published articles, which may be another source of bias. The articles included were heterogeneous, as expected. This could arise for many reasons. The subjects were of different ages when FEV1 was measured, although age did not appear to influence %FEV1 at least for the BPD analyses. An additional factor that may have influenced the results is the age of the child at testing as age is independently associated with FEV1 (E39). However, since our initial analyses included only papers containing a control group, this influence of age is unlikely to have affected our conclusions. Subjects were born in different decades and treatments have changed over time, which may have led to cohort effects. For example, in some studies a proportion of infants were treated with surfactant to improve their infant lung function, survival and prevent lung injury. The methods for calculating percentage predicted FEV1 varied between studies. We acknowledge that the preterm-born group containing BPD cases is a very heterogeneous group. The results from this group should be treated with caution, although they were broadly consistent with the results in the tightly defined preterm without BPD population. The other three groups are defined more precisely and included only preterm-born subjects from studies which clearly identified the BPD status. We were therefore able to categorise confidently the preterm-born subjects into groups for analysis. This comprehensive systematic review has quantified the deficits in %FEV1 in later life of a number of different groups of subjects born preterm and has shown that, even in subjects without BPD, later %FEV1 is lower than in the population born at term. Future research should follow up these cohorts into middle age and beyond to see if these %FEV1 deficits translate into higher rates of COPD. Efforts should also be made to identify subgroups at higher risk of poorer lung function in later life and to devise interventions to ameliorate the impact of being born preterm. We are very grateful to Mala Mann and Ruth Turley based at the Support Unit for Research Evidence, Cardiff University for their support and help with developing the search strategy.
. Current concepts: chronic lung disease after premature birth. 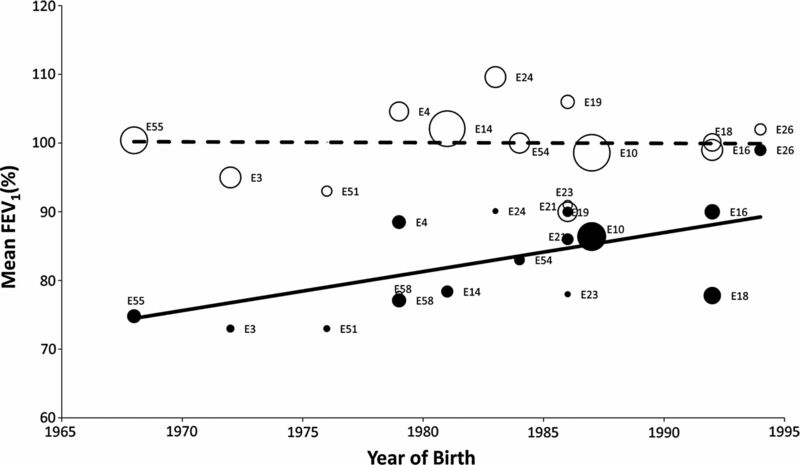 N Eng J Med 2007;357:1946–55.
. Childhood course of lung function in survivors of bronchopulmonary dysplasia. JAMA 2009;302:1418–20.
. Does low birth weight confer a life long respiratory disadvantage? Am J Respir Crit Care Med 2009;180:107–8.
. General and respiratory health outcomes in adult survivors of bronchopulmonary dysplasia: a systematic review. Chest 2012;141:1554–67.
. Estimating the mean and variance from the median, range, and the size of a sample. BMC Med Res Method 2005;5:13.
. Epidemiology and causes of preterm birth. Lancet 2008;371:75–84.
. Exercise capacity in school-age children who had chronic lung disease in infancy. J Pediatr 2013;162:813–18.e1. The Consortium on Safe Labour Respiratory morbidity in late preterm births. JAMA 2010;304:419–25.
. Weight in infancy and death from ischaemic heart disease. Lancet 1989;334:577–80.
. Fetal and infant growth and impaired glucose tolerance at age 64. BMJ 1991;303:1019–22.
. Review series. What goes around, comes around: childhood influences on later lung health? Long-term follow-up of infants with lung disease of prematurity. Chron Respir Dis 2010;7:259–69.
. 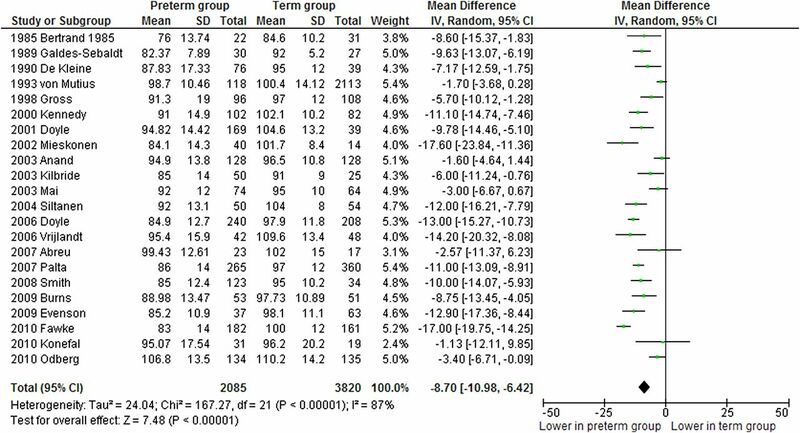 Effects of gestational age at birth on health outcomes at 3 and 5 years of age: population based cohort study. BMJ 2012;344:e896.
. Lung function and respiratory symptoms at 11 years in children born extremely preterm. The EPICure Study. Am J Respir Crit Care Med 2010;182:237–45.
. Long term respiratory outcomes of late preterm-born infants. Semin Fetal Neonatal Med 2012;17:77–81. Contributors All authors led by SK were involved in the concept and protocol design of the systematic review. SJK and MOE screened the titles and abstracts and data extracted the articles. FD and WJW were primarily responsible for statistical analyses. SP was primarily involved in the interpretation of the quality data. All the authors contributed to interpreting the results. SJK wrote the initial drafts of the paper to which all the authors contributed. SK is the guarantor. Ethics approval Ethics approval was not required as this is a systematic review using previously published studies and no new subjects were studied.